By Richard P. Novitzki, ManTech Environmental Technology, Inc.
Wetlands, or the lack thereof, were a significant factor in the severe flooding in the Upper Mississippi and Missouri River Basins in the summer of 1993 (Parrett and others, 1993) (fig. 49). Damages associated with the flooding were undoubtedly worse than they would have been if flood-plain wetlands had still been in place. Human modification of the original wetlands (a common practice in the early part of this century) had destroyed the ability of the wetlands to modify flooding. (See the article "Effects of the Great Midwest Flood of 1993 on Wetlands" in this volume.) Flood control, however, is only one of the values that wetlands have for society. In order to protect wetlands, the public first must recognize the values of wetlands. People need to understand what is lost when a wetland is changed into an agricultural field, a parking lot, a dump, or a housing development. Understanding the functions of wetlands will make it easier to evaluate wetlands when other uses are considered. In the 1970's, scientists, ecologists, and conservationists began to articulate the values of wetlands. At a wetland conference in 1973, wetlands were acknowledged to be an important part of the hydrologic cycle (Helfgott and others, 1973). In 1977, participation at the first National Wetland Protection Symposium-attended by more than 700 people-demonstrated a growing interest in the value of wetlands and the need to protect them (Kusler and Montanari, 1978). At a Wetland Values and Management Conference in 1981, scientists defined the unique qualities of wetlands and developed a list of wetland functions (Richardson, 1981). In addition to the more commonly recognized habitat functions of wetlands, the scientists described hydrologic and water-quality functions. During the 1980s, participants at many more conferences and symposia expanded the understanding and appreciation of the values of wetlands (Kusler and Riexinger, 1986). Wetlands are among the most productive habitats in the world. Wetland functions are defined as a process or series of processes that take place within a wetland. These include the storage of water, transformation of nutrients, growth of living matter, and diversity of wetland plants, and they have value for the wetland itself, for surrounding ecosystems, and for people. Functions can be grouped broadly as habitat, hydrologic, or water quality, although these distinctions are somewhat arbitrary and simplistic. For example, the value of a wetland for recreation (hunting, fishing, bird watching) is a product of all the processes that work together to create and maintain the wetland. Not all wetlands perform all functions nor do they perform all functions equally well. The location and size of a wetland may determine what functions it will perform. For example, the geographic location may determine its habitat functions, and the location of a wetland within a watershed may determine its hydrologic or water-quality functions (fig. 50). Many factors determine how well a wetland will perform these functions: climatic conditions, quantity and quality of water entering the wetland, and disturbances or alteration within the wetland or the surrounding ecosystem. Wetland disturbances may be the result of natural conditions, such as an extended drought, or human activities, such as land clearing, dredging, or the introduction of nonnative species. If something has "value," then it is worthwhile, beneficial, or desirable. The value of a wetland lies in the benefits that it provides to the environment or to people, something that is not easily measured. Wetlands can have ecological, social, or economic values. Wetland products that have an economic value, such as commercial fish or timber, can be assigned a monetary value. True wetland value, however, goes beyond money. How much value does one place on the beauty of a wetland or its archeological significance? Wetland values are not absolute. What is valuable and important to one person may not be valuable to another person. As an example, the value of a wetland as duck habitat may be important to the hunter or birdwatcher but not to the farmer who owns the land. "While wetland functions are natural processes of wetlands that continue regardless of their perceived value to humans, the value people place on those functions in many cases is the primary factor determining whether a wetland remains intact or is converted for some other use" (National Audubon Society, 1993). In addition, values assigned to wetland functions may change over time as societys perceptions and priorities change. The values that benefit society as a whole tend to change slowly; however, the values assigned by individuals or small groups are arbitrary, and most are subject to rapid and frequent change and may even conflict. For example, timber production may be improved by draining a wetland site, whereas waterfowl production may be improved by impounding more water. Society may have to resolve conflicts regarding the management or preservation of wetlands and their functions. Furthermore, society may have to choose among wetland functions that benefit individuals or small groups, that are of value to most of society, or that are important to the maintenance of the wetland itself. The values that benefit society as a whole tend to change slowly; however, the values assigned by individuals or small groups are arbitrary, and most are subject to rapid and frequent change and may even conflict. For example, timber production may be improved by draining a wetland site, whereas waterfowl production may be improved by impounding more water. Society may have to resolve conflicts regarding the management or preservation of wetlands and their functions. Furthermore, society may have to choose among wetland functions that benefit individuals or small groups, that are of value to most of society, or that are important to the maintenance of the wetland itself. Wetland functions have value on several levels-internal, local, regional, and global. All wetland functions are internal, but the values or benefits of wetland functions can be internal or external to the wetland (fig. 51). Functions that provide internal values are the functions that maintain or sustain the wetland and are essential to the continued existence of the wetland. Conversely, many functions have external values that extend beyond the wetland itself. On a local scale, wetlands affect adjacent or nearby ecosystems, for example, by reducing flooding in downstream communities or by removing nutrients from wastewater. However, the broadest influence of wetland functions is global. Wetlands are now thought to have a significant effect on air quality, which is influenced by the nitrogen, sulfur, methane, and carbon cycles. In addition, migrating birds are dependent upon wetlands as they travel. Figure 51. Wetland functions and internal and external values. Many times when decisions are made about development of an area, such as the selection of a site for a large commercial or industrial facility, the choice of sites is not between a wetland or an upland, but between wetlands. In areas that have many wetlands, all alternative sites or routes for roads for a major facility may involve the destruction or alteration of wetlands. In such cases, legal requirements commonly exist that require the replacement of destroyed wetlands. Even when a choice must be made between a wetland site and an upland site, the upland site may have great value to the community. Managers, planners, regulators, and even the general public have long felt the need to have in place a system of assessment or evaluation that would make the choices clearer and ensure that the most valuable wetlands are preserved. Such an evaluation system could be based entirely or partly on wetland function if values could be assigned to individual functions. Wetland assessment methods have been or are being developed that assign numerical values to wetland functions. Some methods assign values on the basis of the benefits to the wetland itself by considering the question: How important is this function in terms of maintaining this particular wetland? Other methods assign values on the basis of the benefits to surrounding ecosystems or to humans. The types of questions considered in this approach are as follows: How important is this function to environmental quality downstream? How does this function benefit society? This latter assessment method allows for the comparison of the worth of one wetland to that of another wetland. The development of a single method for assessing the functions of wetlands or for assigning values to the functions of wetlands is not a simple task. Indeed, probably no one method will satisfy all needs. However, assessing each function of a wetland and then assigning a value to each function is a step toward the protection of sensitive wetlands. Furthermore, an evaluation system that provides the basis for comparing wetlands would facilitate mitigation for unavoidable wetland losses, would provide a tool for determining the success (or failure) of programs and policies intended to protect or manage wetland resources, and would assist in identifying long-term trends in the condition of wetland resources. The three wetland assessment methods described herein are representative of the methods that are available or are being used by wetland managers and planners. The Wetland Evaluation Technique was developed for the Federal Highway Administration and has been used widely. It assigns values to specific functions of individual wetlands. The Environmental Monitoring Assessment Program--Wetlands was developed by the Environmental Protection Agency. It is presented here as an example of a program that focuses on determining the ecological condition of a population of wetlands in a region. It does this by comparing the function of a statistical sample of wetlands to reference wetlands in the region. The Hydrogeomorphic approach is being developed by the U.S. Army Corps of Engineers for assessing wetland functions. It combines features of the other two methods by measuring the functions of individual wetlands and also by comparing them to functions performed by other wetlands. A System of wetland assessment is necessary to ensure that the most valuable wetlands are protected. The WET evaluates functions and values in terms of effectiveness, opportunity, social significance, and habitat suitability. Effectiveness assesses the capability of a wetland to perform a particular function. For example, a wetland that has no outlet is assigned a high value for sediment retention, whereas a wetland just downstream from a dam is assigned a low value. 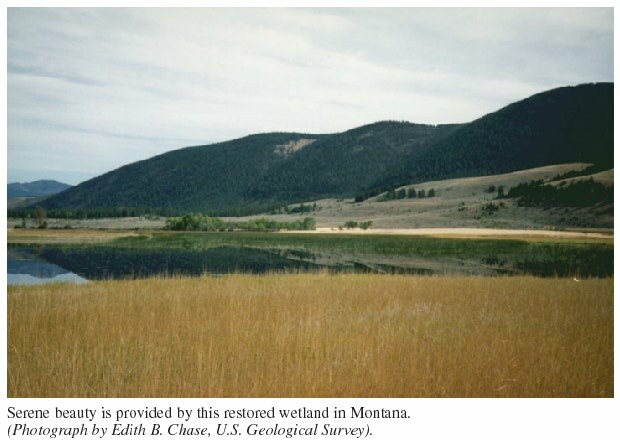 Opportunity assesses the potential for a wetland to perform a specific function; for example, a wetland in a forested area that has no potential sediment sources would be assigned a low opportunity value for sediment retention. Social significance assesses the value of a wetland in terms of special designations (does it have endangered species? ), potential economic value (is it used regularly for recreational activities? ), and strategic location (is it in a State where very few wetlands of its type remain?). The WET uses "predictors" that relate to the physical, chemical, and biological characteristics of the function being evaluated. As an example, the presence or absence of a constricted outlet from a wetland could be used to predict whether the wetland might be effective in storing floodwaters. In addition, WET can be used to assess the habitat suitability for waterfowl and wetland-dependent birds, fish, and invertebrates. The WET approach was designed to provide a balance between costly, site-specific studies and the "best professional judgment" approach, which is less costly but lacks reproducibility. The WET method is intended to be used by any environmental professional, so that an engineer can evaluate biological functions or a biologist can evaluate hydrologic functions. First, information resources are obtained for the wetland, the area surrounding the wetland, and the area downstream from the wetland. Then a series of questions is answered about the wetlands watershed, topography, vegetation, and other features. By progressing next through a series of flow charts (or an available computer software package), an evaluation can assign a probability rating of "high," "moderate," or "low" to each of the functions listed above (except for recreation) and a habitat suitability rating for waterfowl, fish, and other wildlife (Adamus, 1988). The probability rating is an estimate of the "likelihood" that a wetland will perform a function on the basis of its characteristics. It does not estimate the degree or magnitude to which a function is performed. Recreation is not evaluated because no scientific basis exists for making an objective assessment without extensive data collection at the site. The WET approach probably has been applied to nearly every type of wetland in every State; however, it has proved to be unwieldy to use. For most users, the need to be able to apply this method to every wetland in every part of the United States makes the system unnecessarily cumbersome. For example, most users are interested in a local area and prefer not to enter data repeatedly for local characteristics that are unlikely to change, as is required in the WET approach. In order to refine the method for specific regions and to refine the thresholds among the low, medium, and high values, Adamus (1988) intended that regional versions and five different levels of WET be developed, neither of which has happened. Despite its shortcomings, however, WET continues to be used by those who are familiar with it. Furthermore, much of the data generated by its application could be used to create data bases that would simplify its use and would improve its regional application. The WET evaluates functions and values in terms of effectiveness, opportunity, social significance, and habitat suitability. In 1988, the Environmental Protection Agency initiated the Environmental Monitoring Assessment Program (EMAP) in order to provide improved information on the status and trends in the condition of the Nations ecological resources. The wetlands part of EMAP was intended to develop an approach for assessing the condition (how well a wetland is performing its functions) of different types of wetlands in a region and in the Nation as a whole (Novitzki, 1994; Novitzki and others, 1994). The near-term objectives of the program were to conduct research in order to identify "indicators" of wetland condition, to standardize methods of measurement, and to establish a national network for monitoring wetlands at regional scales and over long periods (decades). In some places, it is impossible or impractical to measure wetland functions directly; therefore, characteristics or "indicators" are measured, and these indicate how well certain functions are being performed by the wetland. For example, the number of waterfowl per acre can be calculated from actual field measurements and then can be used as an indicator of how well a wetland is performing its waterfowl habitat function. The EMAP-Wetlands program was intended to have three phases. First, pilot studies were to be conducted to evaluate the ability of selected indicators to make a distinction between healthy and degraded wetlands. Next, regional demonstrations were to be conducted by using some of the best indicators from the pilot studies. These demonstrations would confirm the ability of the program to assess the condition of a specific type of wetland in a specific region. Finally, the program would be implemented to monitor the condition of a specific wetland type in a region. Only Phase I has been conducted. EMAP-Wetlands identifies "indicators" of condition, standardizes methods of measurement, and establishes a national network. Data from pilot and demonstration studies in Phase I are being analyzed to develop preliminary indices of signs of the health of a wetland. One index will be for biological integrity, which combines indicators of healthy plant and animal communities. Biological characteristics of the sampled wetlands will be compared with those of the most unaltered wetlands of the same type in the region, known as reference wetlands. This comparison is based on the assumption that the least altered wetlands have sustainable biological integrity. Other likely indices will be related to the following: habitat integrity (how does the population of waterfowl, finfish, or shellfish in sampled wetlands compare with that in reference wetlands? ), hydrologic integrity (how similar is the hydrologic regime in the sampled wetlands to that in reference wetlands? ), and water-quality improvement (how do sediment trapping and other water-quality processes in sampled wetlands compare with those in reference wetlands?). Wetland health may be evaluated either by similarity (how similar are sampled wetlands to reference wetlands?) or by biological criteria (are the sampled wetlands above or below a level determined from measurements obtained in the reference wetlands?). The comparison of the condition of sampled wetlands with the condition of reference wetlands provides a means for telling the difference between changes that result from long-term changes in climate (both sampled wetlands and reference wetlands will be affected) and changes that happen because of management actions, regulatory policy, or other human factors that affect wetlands (only the sampled wetlands will be affected). In 1990, the U.S. Army Corps of Engineers began developing the Hydrogeomorphic Approach (HGM) as a way to provide a foundation for assessing the physical, chemical, and biological functions of wetlands (Brinson, 1993; Smith and others, 1995). The program, still being developed, is intended to revise and simplify the WET approach described above (Adamus and others, 1987), as well as make it more applicable to specific regions. The WET procedure develops a profile of specific characteristics (predictors) for an individual wetland, and these are used to assess the degree of effectiveness of the different functions of the wetland. The HGM approach compares the characteristics of a specific wetland with the characteristics of a group of wetlands (reference wetlands) in the region, and this information is used to assess the degree to which the individual wetland is performing selected functions. Thus, the HGM approach represents a combination of the WET and EMAP-Wetlands approaches. Wetland characteristics to be evaluated by HGM are limited to those that are important in the specific region and hydrogeomorphic setting. Hence, different characteristics will be identified and evaluated for different hydrogeomorphic settings, such as closed basins in the Midwest (for example, prairie pothole wetlands), river-edge wetlands in the Southeast (for example, bottom-land hardwood wetlands), and coastal wetlands (for example, salt marshes). In the HGM approach, local wetland scientists or managers identify the functions that are performed by wetlands in a specific hydrogeomorphic setting in that region. Also, they identify wetland characteristics (indicators), such as plant communities, plant species, and density of stems, that suggest whether or not a wetland is performing a specific function, such as slowing the flow velocity of floodwater. Next, the value of each function is determined by measuring the degree to which that function is likely to be performed. This is based on the characteristics of the indicators. For example, if lines of debris are selected as an indicator that a wetland has been flooded, their altitude may be used to determine how deep the water may have been during flooding and thus how much water may be stored in the wetland. The nature of the debris lines also may suggest the velocity of the water as it moved through the wetland. For example, small leaves and twigs suggest slow-moving water, small branches suggest somewhat swifter water, and large branches and tree trunks suggest very high velocities. Sediment deposits observed at the site may suggest the depositional characteristics. For example, no sediment deposits suggest little deposition, thin silt deposits suggest that slow-moving water was sustained for long periods, and gravel and cobble deposits might suggest that water was flowing rapidly when it entered the site but then slowed significantly at the site. The HGM approach respresents a combination of the WET and EMAP-Wetlands approaches. A wetland assessment provided by the HGM approach will likely be a "site profile" that lists the site characteristics that are related to identified wetland functions. This profile then will be compared with characteristics of the reference wetlands (all wetlands in the region in the same geomorphic class) in order to rank the site. A data base that contains profiles of wetland characteristics (indicators of wetland functions) for each wetland type (hydrogeomorphic class) will be established for each region. These data will define the range of characteristics found in these wetlands. At present (1995), the HGM approach is in development and has not been released to the public. Field tests of this assessment method have been conducted in river-edge wetlands in the Pacific Northwest, the Northeast, the Rocky Mountains, the Southwest, and the Southeast; in coastal wetlands in the Pacific Northwest, the North and South Atlantic States, and the gulf coast States; and in closed-basin wetlands in the Midwest. Data and insights derived from these tests are being compiled and will be evaluated in regional workshops. Following those evaluations, manuals of draft HGM methods will be prepared and presented for comment and review in regional workshops. If any hope remains for preserving the Nations wetland resources, it depends upon obtaining public support. Public support can be won if scientists can explain clearly how wetlands function, how they interact with their surroundings, and how their functions can benefit society. Wetlands have come under intensive scientific study only during the last two decades. Techniques of wetland evaluation will improve as scientists gather more information about the processes that take place in wetlands and about the similarities and differences among the functions of different types of wetlands. In order to develop public support and to encourage enlightened policy decisions and regulations, it is critical to create and maintain a data base of wetland characteristics in which the data are reliable, comparable, and repeatable at periodic intervals in order to monitor long-term trends. More than one approach to wetland evaluation is possible, as illustrated by the examples discussed above. Wetland functions and their values to humans and other living matter may be assessed for an individual wetland by using approaches such as WET or HGM. After this, they can be compared with other natural wetlands in a region by using the HGM approach. Both WET and HGM can be used to determine the amount of mitigation required to offset unavoidable wetland loss, as well as to evaluate the degree of success of individual mitigation projects. (See article "Wetland Protection Legislation" in this volume for further discussion of mitigation.) The EMAP-Wetlands approach suggests that it might be possible to examine the condition (pristine or degraded) of a population of wetlands in a specified area. Periodic reevaluation of this population of wetlands might be used to determine trends in their condition and to identify the effects of broad policy decisions (such as "no net loss"), programs (such as mitigation banking where wetlands are created or restored to offset losses of other wetlands), or natural phenomena (such as climate change). It is critical to create and maintain a data base of wetland characteristics in which the data are reliable, comparable, and repeatable. FHWA Assessment method, v. 2 of Method for wetland functional assessment: Washington, D.C., U.S. Department of Transportation, Federal Highway Administration Report no. FHWA-IP-82-24, 134 p.
The FHWA/Adamus (WET) method for wetland functional assessment., in Hook, D.D., McKee, W.H., Jr., Smith, H.K., Gregory, James, Burrell, V.G., Jr., DeVoe, M.R., Sojka, R.E., Gilbert, Stephen, Banks, Roger, Stolzy, L.H., Brooks, Chris, Mathews, T.D., and Shear, T.H., Management, use, and value of wetlands, v. 2 of The ecology and management of wetlands: Portland, Oreg., Timber Press, p. 128-133. Wetland Evaluation Technique (WET), v. 2 of Methodology: Vicksburg, Miss., U.S. Army Corps of Engineers, Waterways Experiment Station, Operational Draft Technical Report, 206 p. + appendixes. Critical review and evaluation concepts, v. 1 of Method for wetland functional assessment: Washington, D.C., U.S. Department of Transportation, Federal Highway Administration Report no. FHWA-IP-82-23, 176 p.
Hydrogeomorphic classification for wetlands: Washington, D.C., U.S. Army Corps of Engineers, Wetlands Research Program Technical Report WRP-DE-4, 79 p.
First Wetland Conference: Storrs, Conn., University of Connecticut, Institute of Water Resources, Report 21, Proceedings, 199 p.
Our national wetland heritage-A protection guidebook: Washington, D. C., Environmental Law Institute, p. 4. National Wetland Protection Symposium: U.S. Fish and Wildlife Service, Office of Biological Services, FWS/OBS-78-97, Proceedings, 255 p.
National Wetland Assessment Symposium: Albany, N.Y., Association of State Wetland Managers, Proceedings, 331 p.
McGraw-Hill dictionary of scientific and technical terms: New York, McGraw-Hill Book Company, 1634 p.
Saving wetlands-A citizens guide for action in the Mid-Atlantic region: Camp Hill, Pa., National Audubon Society, 130 p.
EMAP-Wetlands-A program for assessing wetland condition, in Mitsch, W.J., ed., Global wetlands-Old World and New: New York, Elsevier Science Publishers, p. 691-709. EMAP-Wetlands-Research strategy for the assessment of wetland condition: Corvallis, Oreg., U.S. Environmental Protection Agency, Environmental Research Laboratory, 149 p.
Flood discharges in the upper Mississippi River basin, 1993: U.S. Geological Survey Circular 1120-A, 14 p.
Selected proceedings of the Midwest Conference on Wetland Values and Management: Navarre, Minn., Freshwater Society, 660 p.
Wetlands of Rhode Island: Newton Corner, Mass., U.S. Fish and Wildlife Service, National Wetlands Inventory, 71 p., appendix. Indicator development for evaluating estuarine emergent conditions�salt marsh pilot�technical narrative (draft final report): Baton Rouge, La., Louisiana State University, v. 1, 65 p.